This is not a new book by any means, clearly; it’s been thirty-one years since Amelia Peabody joined the fiction realm. I came by this book in a round about way. I was doing one of my bookstore browses a number of months ago when I came upon The Laughter of Dead Kings, the sixth Vicky Bliss novel. I didn’t know it was the sixth when I grabbed it, so I went back and bought two different Elizabeth Peters books: the first Vicky Bliss and it’s quasi prequel, The Camelot Caper. I read The Camelot Caper and absolutely loved it, amazed how little it had aged for a novel that was contemporary to the 1970s. I was taking it to work to read during tutoring lulls, and my co-worker had a bit of a fangirl moment about Elizabeth Peters and told me not to read Vicky Bliss, but that I HAD to read Amelia Peabody. 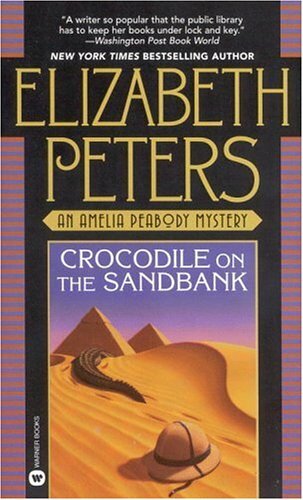 She described Amelia Peabody to me, I concurred that she was right, and went out and bought Crocodile on the Sandbank. It took me until Thanksgiving to finally pick it up. How very, very silly of me. Amelia Peabody is part Indiana Jones and part Sherlock Holmes but a female leading lady with the same punch as Evy Carnahan-O’Connell in The Mummy movies. Honestly, there’s nothing about her not to like. Amelia decides to go to Cairo, and en route meets Evelyn, a down and out former heiress who has been shamed by her family, desperately in need of a motherly friend. She gains that in Amelia who insists that Evelyn join her in her travels down the Nile. While they wait in Cairo for their boat to be ready, they meet the brothers Emerson. Walter, the younger of the two, is charming, easy to like, and caring. Radcliffe is grumpy, angry, and stubborn as an ox. They of course, through a set of unfortunate events, end up at the same archaeological dig, under the attack of a mummy. Convinced that there is no supernatural work afoot, Amelia and her companions set to work trying to prove that, not only to the superstitious locals, but to themselves. There were so many things about this book that I loved. First, Amelia is an authentic Victorian voice. She speaks like a Victorian, she writes like a Victorian, and she apologizes for words and phrases that are not necessarily polite for a woman to use. The setting feels authentic, but not overworked. The characters are fun, and pull the story along. It’s an adventure/mystery, and fits within the standard formula, but you enjoy it for the ride, like you should any other adventure book. The only thing that could improve this book is time. Time to get to know the characters better, to grow even more attached to them, and to see them develop. But that’s what the other eighteen books are for, aren’t they? If you like Victorian literature, historic literature, adventure books, or adventure films, this is my current recommendation. It was just fantastic. I’ve started the 2nd one and can’t stop laughing at Amelia’s attempts to be a mother. So good.